I have a cute new pin cushion to share! 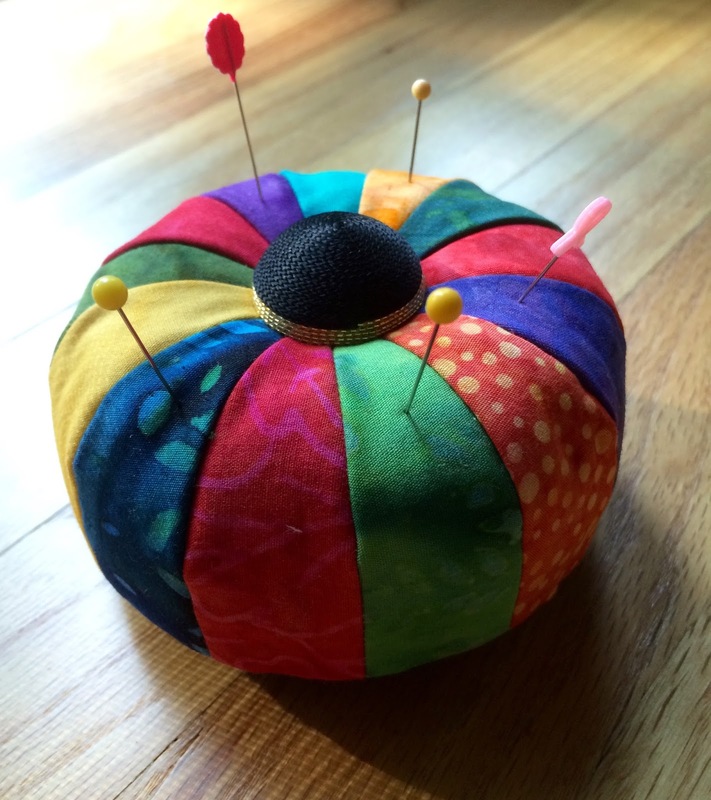 It is called the Color Wheel Pin Cushion. It comes in a neat little package containing the pattern, wooden base, screws, cord, foam cushion, walnut shells and felt. I supplied my own fabric and buttons (one for the top and one hidden underneath. Oh--it includes the directions, too! Color Wheel Pin Cushion from License to Quilt. I had most of it done in an afternoon while enjoying our employee sew session last Thursday. But it took me a little searching to find something for the legs. They don't show in this picture, I just used little black 1/2" wooden beads painted black. The directions called for wooden knobs, like drawer pulls, but I could find nothing like that and get it to fit onto the screws provided. So I resorted to little beads because they had a 1/8" hole to fit the screw. And since I couldn't find any craft paints in the jumbled up mess that has invaded my sewing space while we are doing a little renovation, I used a black Sharpie. The kit costs $18, but includes almost everything you need. And I found out there are refill kits available so I will be ordering those, too. And yes, we do mail orders, and charge only the amount of the required postage to get it to your mailbox!